This house has been around for a while, having been built by Monte Davidson, a musician here at the Lake, in 1972. 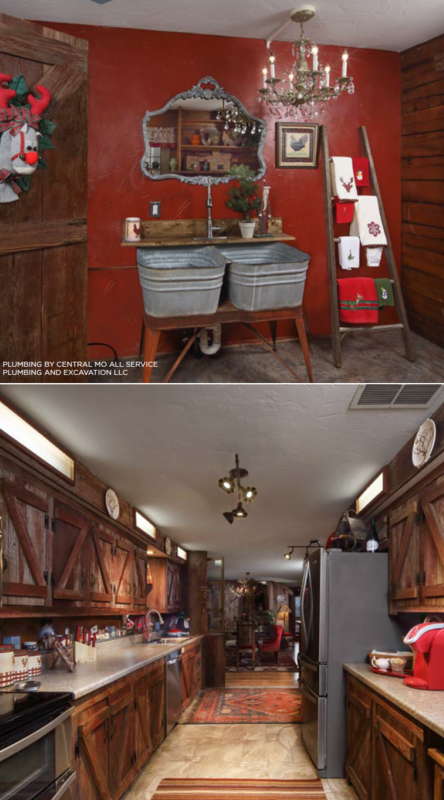 The kitchen cabinets were fashioned from wood taken from his uncle’s mule barn, and they still have the original finish. The home had two other owners after that, then was vacated and left unattended for a long time. Two Mennonite men from Eldon bought it from the bank and replaced all the windows, put in central heat and fixed it up enough to put back on the market. 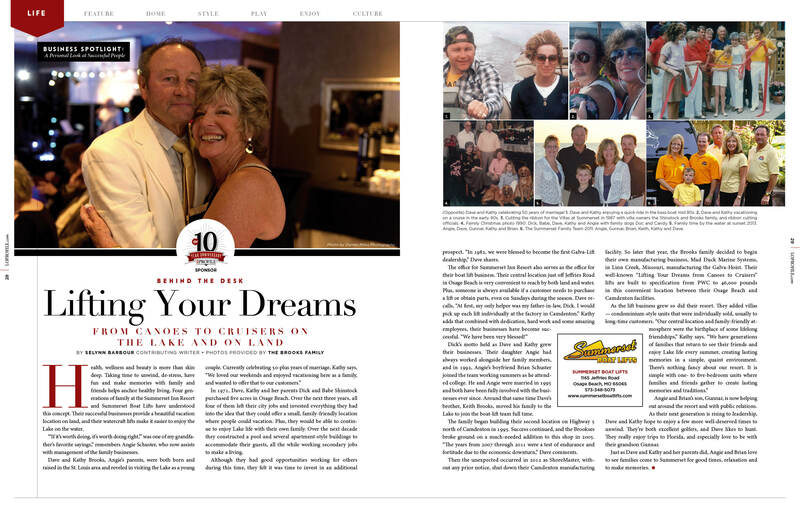 Manny and Vickie Vardakis bought it in late 2015 and spent several months making it livable again and making it “theirs.” Manny says he never dreamed he would ever live in a log home. He’s a city boy! 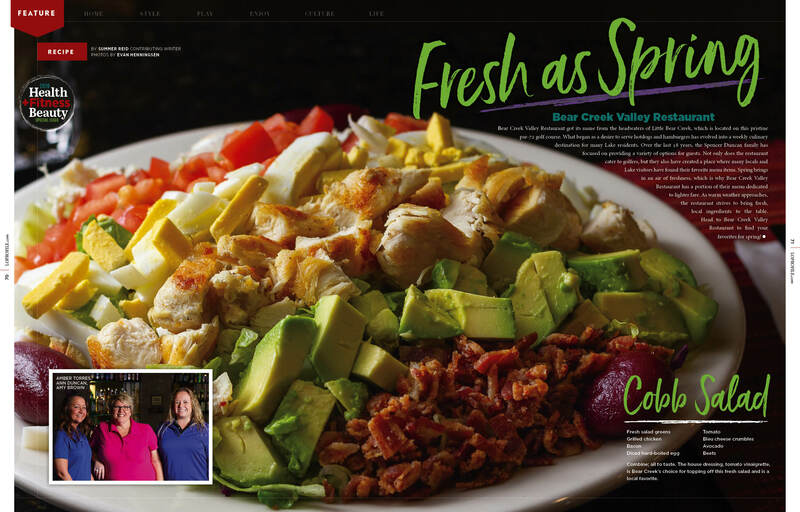 But now he loves being here with Vickie, and although their fulltime home is in Kansas City, they spend as much time here as they can with their three dogs, Max, Sammy and Yanni. 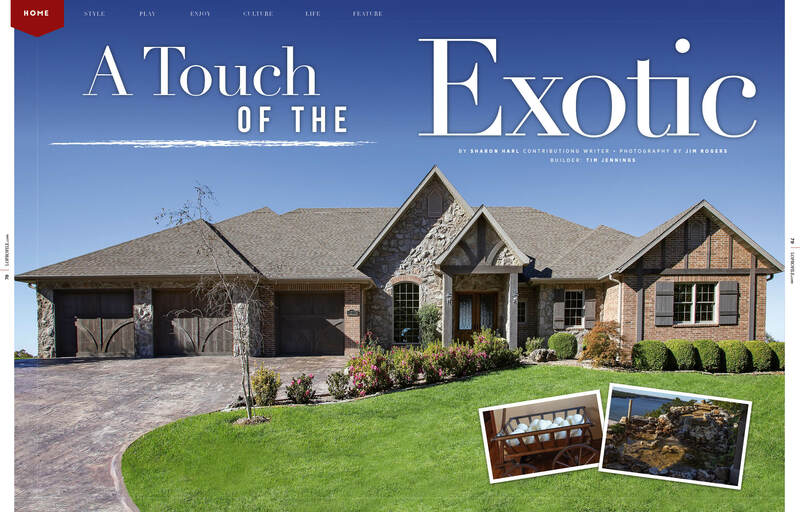 Vickie lived here at the Lake for a long time, and is the former owner of both House of Stewart Antiques and Euro Bella in Osage Beach, both home decorating specialty shops and women’s boutiques, which explains her fabulous decorating touches. Now, she finds many of these at Evergreen in Osage Beach. 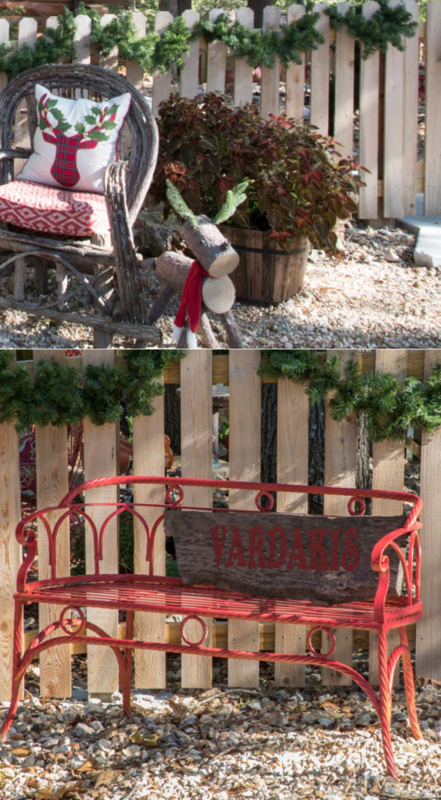 In front of their home, the Vardakises built a picket fence around the little courtyard and Vickie proceeded to add her special touches to every corner. This time of year, holiday ribbons and wreaths festoon the fenceposts and, along with the lantern on the entrance post, a nearby Santa welcomes visitors to their happy home. Just inside the front door, a wreath made by Vickie greets visitors. In the middle of the wreath is a Santa made of wood, hand-painted and embellished with burlap ribbon and handmade bows. Atop a nearby console table are candlesticks made from antlers, as well as an antique fishing basket from France that originally was used as a picnic basket. 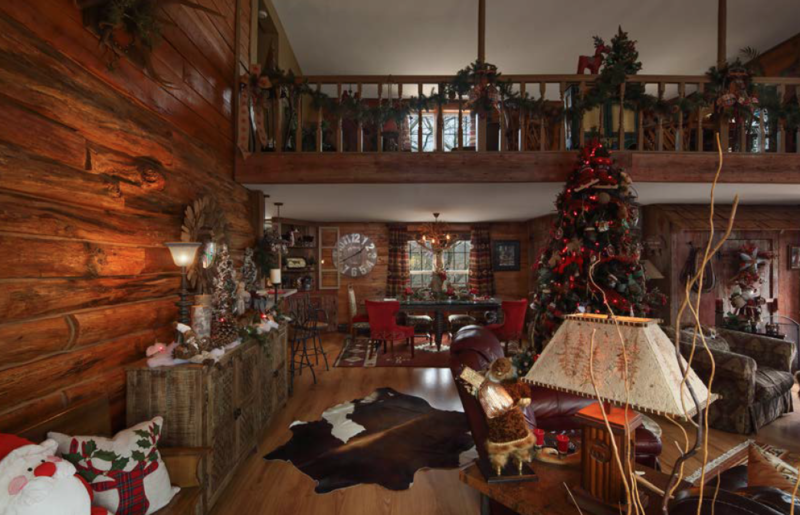 Step around into the living room, where deer and moose heads and antlers are on every wall! Some are real, some are faux. A silver moose head is a new addition to the family. Some are “framed” — one of Vickie’s many artsy touches. Real antlers and a real rawhide shade have been fashioned into a chairside lamp. 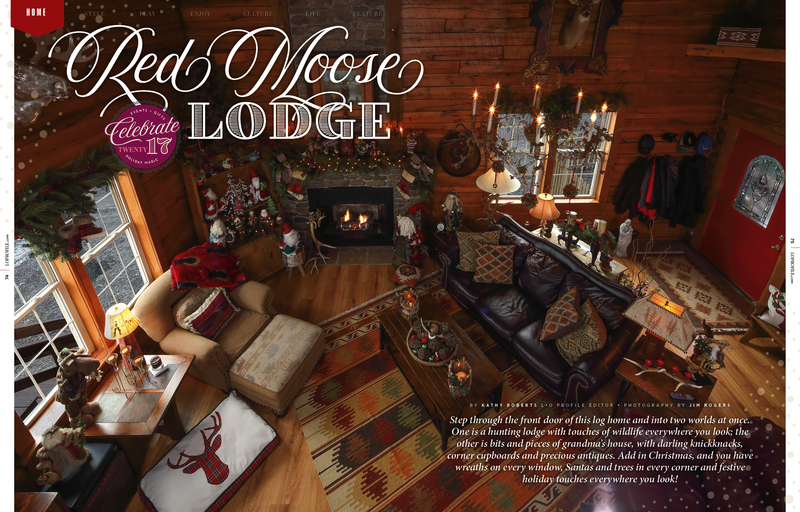 A Christmassy woodland theme dresses up the fireplace with greenery, pinecones, an antique lantern, moose and real antlers — even the fireplace screen has a moose theme! Elk antlers holding the fireplace tools are real, but the framed deer head hanging on the wall nearby isn’t. 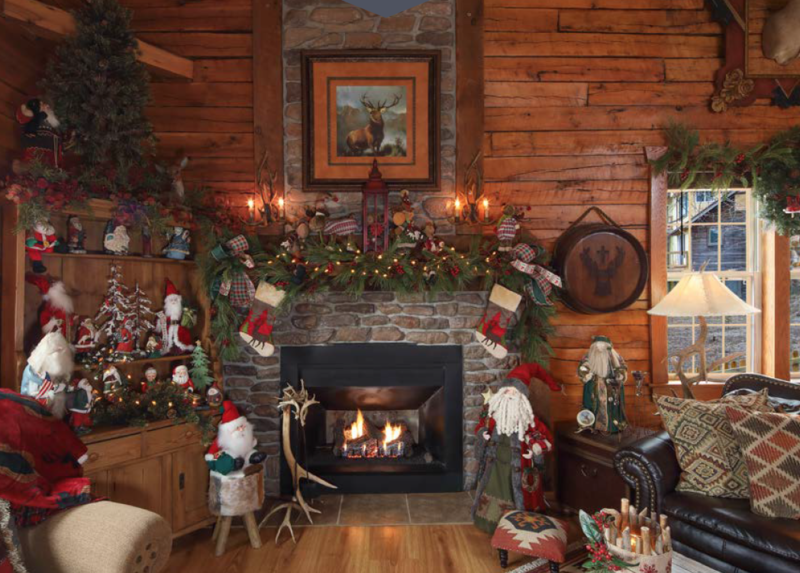 Garlands intertwined with tiny moose-head lights festoon the fireplace mantel, and the stockings hanging below are decorated with deer. Evergreen branches topping the room’s windows are beaded with snow boots. A corner cupboard near the fireplace holds many of Manny’s Santa collection. He has lost count of how many he has, but knows there are more than 50. They not only are special to him, but most also are collector’s items. He has been gathering them since the 1980s, and now Vickie gifts him with another every Christmas. The chandelier here appears to be antique, but it’s not. Vickie likes for everything to appear as though it has texture and comes from nature, so this is draped with vines gift from Vickie’s daughter that, of course, Vickie embellished just a little with lights and beads and little gift packages. The eye-catching chandelier is crafted from faux antlers from fallow deer, not moose. A corner cupboard near the table holds a couple more of Manny’s Santas, as well as some items dear to Vickie’s heart — all decorated for the season. Between the dining room and kitchen is a small bar. They love to entertain! The barstools are from Arkansas, and the backs are intricately woven iron branches. It’s easy for guests to sit here and sip wine while Vickie is working her magic in the kitchen. The one-of-a-kind cupboard and cabinet doors in the kitchen show off the barn wood that was original to the house. The Vardakises liked the weathered look, and decided to leave it that way, imperfections and all. 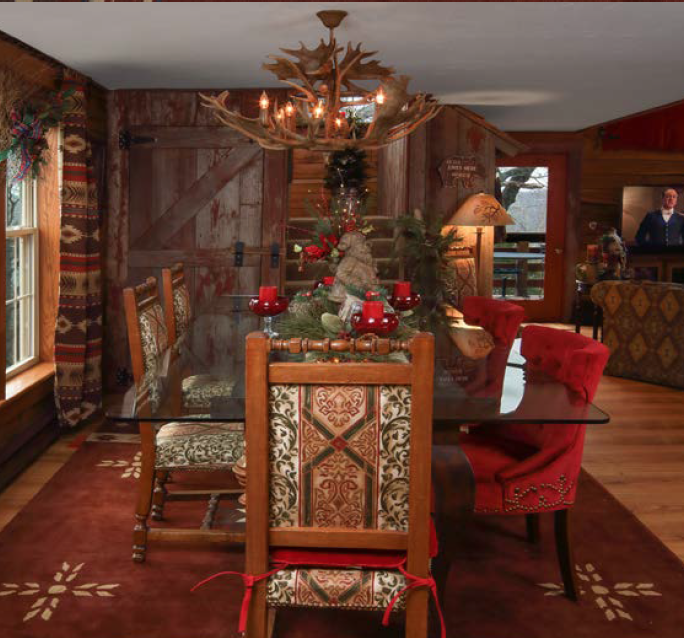 The embellishments — both during the holidays and yearround — are chosen to complement the wood. Vickie decorated the backsplash and windowsill with little Santa figurines and other small Christmas items that Manny has had for years. Most Elite Homes wouldn’t include the laundry room, but this one just couldn’t be passed up. Manny’s antique mirror hangs over antique tin laundry tubs. The beautiful crystal chandelier — or what Vickie calls her “cute little bling bling thing” — was actually hanging up in the loft when they bought the house. There were two of them, which Vickie took down and replaced with wrought iron chandeliers and red rawhide shades. She wanted to put the chandelier somewhere, though, because she felt it was part of the house. So she thought it would look cute hanging over the sink in the laundry room. She says it makes her feel like a princess when she’s doing the laundry! Down a short hallway is the master suite. The master bath is dressed for the season with large gold deer and little owls intertwined with candles and greenery. The large shower here has a low threshold, which will make it easier for them to use as they get older. In the master bedroom is another sample of intricate ironwork in the headboard and footboard of the wood-and-iron bed, with comfy, colorful quilting. The other three bedrooms are upstairs. Another deer head is framed in red at the top of the stairs. A small nook here holds a chair and small desk, topped by a butterfly lamp that belonged to Vickie’s mother in the 1950s and came from Vickie’s childhood home. It was made by the Van Brickle Pottery Co. that has been in Colorado Springs for many years. The shade encases real butterflies and real little dried flowers. Vickie says it is her most prized possession since it was her mom’s, and that it was always on her mother’s organ with a pink lightbulb in it. Next to the railing overlooking the living room are little rawhide-and-cedar chairs from Mexico adorned with moose pillows. They’re not antique, but from the ’70s. A small table between them holds a festively decorated reindeer and a small Christmas tree. Nearby is a TV lounging area. Above both this area and over the stairway are the three-lamp lights with rawhide shades. Just a few steps down the hallway is a full bath with moose and little Santas on antiqued wood shelving. This room was remodeled when the Vardakises moved in, with a new floor, tile and plumbing. Another half bath is decorated with sparkly deer and a white furry Santa. The attention-getting distressed wood floor — Vickie’s favorite improvement ‒ is embellished with a beautiful white furry rug. 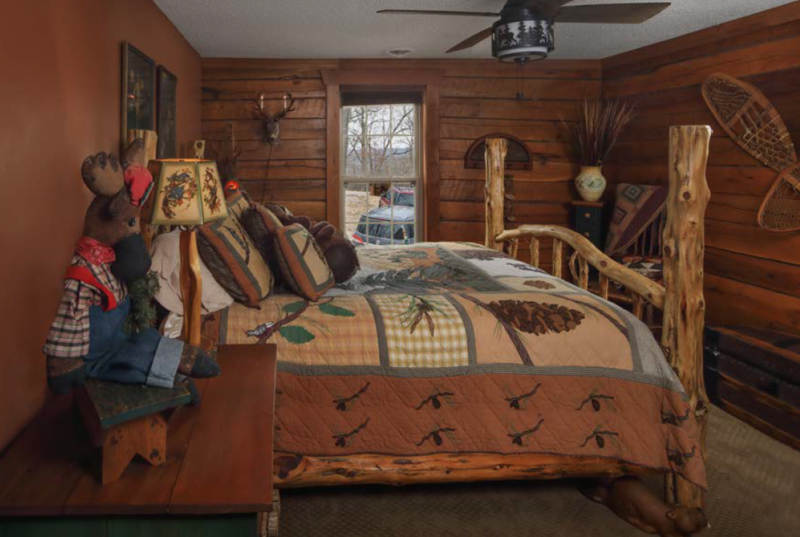 Forest and wildlife is the theme for the front bedroom, which is called “The Moose Room.” The bed is constructed from heavy cedar logs and branches that have been stripped and varnished. A deer head on the wall holds two FLOORING AND CABINETRY BY electric candles, while a bedside lamp — which they acquired on a trip to Florida — is prettified with bluebirds. Antique snowshoes hang on one wall, and a carved wood beaver peeks from under the bed. A green antique cabinet that Vickie bought for her daughter in 1972 fills one corner. Vickie keeps a few heirlooms here, including the painted leather suitcase atop the cupboard, and some very old books inside. Just next door is another bedroom called the “Red Room.” The big, heavy, queen-size four-poster was the couple’s first bed when they were married, but wasn’t big enough for them and their three dogs! On one wall is a jigsaw puzzle that Vickie’s mom assembled when she was in her 90s, and Vickie subsequently had sealed and framed. The little green desk is one of Vickie’s heirlooms, and the matching chair is needlepointed. A beautiful gold settee in the corner is a collector’s piece that she bought in Little Rock in 1972 and brought back on her dad’s little 2-seater airplane! The third and smallest bedroom is the “Fishing Room.” When they bought the house, lots of little pegs had already been built into the wall that may have been gun racks or coat hooks. Various “fishing equipment” now hangs from the hooks, including a creel and a net decorated with little wood fish. A beautiful sconce beside the door is decorated with a snowshoe, and evergreen trees appear when it’s lighted. Back downstairs, step out the back door and onto their fabulous new deck! Vickie and Manny love sitting out here even on warmer winter days with their cocoa, watching the birds and the Lake through the trees. The railings on the deck have steel belly balusters in a beautiful textured antiqued bronze color. Beneath this deck is a protected space for Vickie to park her prized little convertible. Oh, there’s no place like home for the holidays ’Cause no matter how far away you roam If you want to be happy in a million ways For the holidays you can’t beat home, sweet home.